Since May 2018, MSF has supported the Bay Regional hospital in Baidoa, in the South West State of Somalia, to address the health needs of women and children. From May to December 2018, over 4,000 women received antenatal or postnatal consultations and over 1,500 women were admitted in the maternity ward. A total of 686 babies were delivered in that 8-month period. In Somalia, maternal mortality rates are among the highest in the world. One in 12 women is likely to die during pregnancy, childbirth, or the postpartum period because of lack of access to health services. Similarly, infant mortality is exceptionally high with one in seven children not reaching the age of five. Halima, 18, lives in a village some 100 km south of Baidoa. She is among the first women to have benefitted from free maternity services for pregnant women and new-borns at Bay Regional Hospital since MSF started its support in May. “I was planning on giving birth at home but after two days of labour I passed out so my relatives put me on a donkey cart and got me to a nearby health centre in Qansah-Dhere district,” says Halima. The next day, Halima was still unconscious and was loaded onto a bus headed to Baidoa. The journey takes a full day but a few hours into the journey, Halima went into labour. 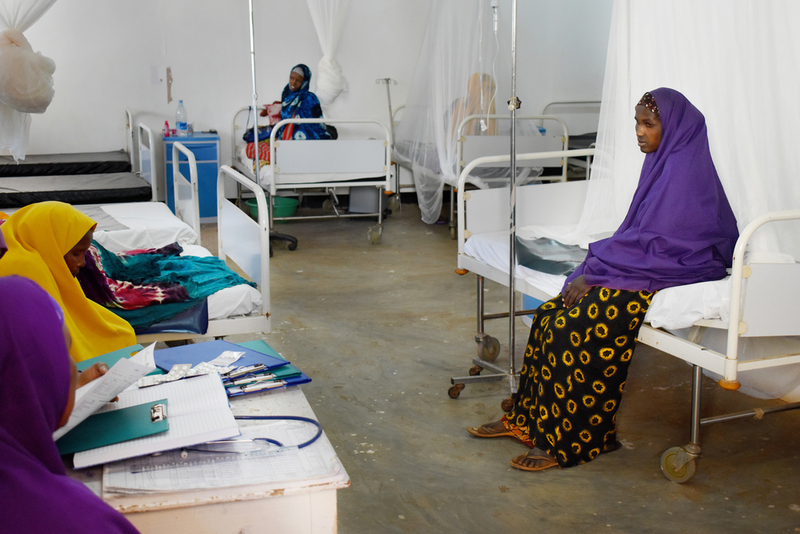 “Since the hospital is the main referral centre in the region, most of the cases we receive are already very complicated ones, whether women have been referred by other health facilities or are self-referred,” says Asma Aweys, MSF’s medical manager at the hospital. The first phase of MSF’s intervention, aimed at establishing a fully functioning comprehensive obstetric unit, will involve supporting the hospital’s capacity to deliver antenatal and postnatal care and ensure normal and complicated deliveries. It will expand in coming months to include developing a neonatal unit and support to paediatric inpatient, outpatients and emergency room services. “MSF is committed to helping women during childbirth. Ordinarily this is a very difficult period in a woman’s life, but given that the fighting has destroyed many health structures, the challenges of giving birth are even greater,” says Himedan Mohammed Himedan, MSF's Head of Programme for Somalia. MSF resumed activities in Somalia in May 2017, after an absence of close to four years due to extreme attacks on its staff and other serious concerns. Since its return to Somalia, MSF has been supporting the Bay Regional hospital in Baidoa and the Mudug Regional Hospital in Galkayo. MSF teams have also provided humanitarian assistance in the displaced camps of Galcayo, nutritional support in Dollow in Dhusmareeb and punctual visits to Jubaland to support child healthcare and prepare for outbreaks in Dhobley, Bardhere and Garbaharey. MSF has conducted cataract surgery eye camps in collaboration with local agencies in Ergavo, Las Anod, Buhodle, Galcayo, Baidoa and Bardhere. “Across Somalia, MSF is looking to ensure that people have access to medical care in areas where the needs are critical and where the security conditions permit. The need for free quality healthcare is very high in Somalia and our strategy is to steadily increase our support to existing structures to improve the services. While the context is certainly challenging, we can rely on dedicated national staff, often medical staff who have already worked with MSF, to build the capacity and ensure improved access to healthcare services in Somalia,” says Gautam Chatterjee, MSF’s country representative for Somalia. In Somaliland, MSF is supporting the diagnosis and treatment of patients with drug-resistant tuberculosis at health facilities in Hargeisa, Borama, Burao and Berbera. MSF is also planning to support other health structures in Las Anod. Moreover, MSF provides medical humanitarian assistance in the Dadaab refugee camp in Kenya as well as in the Somali region of Ethiopia.